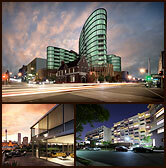 1 Location - Premium Address, Great Transport, Work, Leisure + CBD Access. 2 Demographics - Large white collarwork - Force, Rising Incomes and strong population growth. 8 Product - open plan spacious apartments, larger than competing product. 9 Outlook - City, river and northern views in the only approved 30 level building. 10 Developer - Proven track record, publicly listed company, deliver on budget and on time.